I’ve previously mentioned this over on my writing blog, but since I just recently finished it (okay, not really recently), I wanted to share it with all of you!! My Alassë Míriel Hooded Cowl, which is beautiful and I’m certain will be great for the upcoming cold weather. 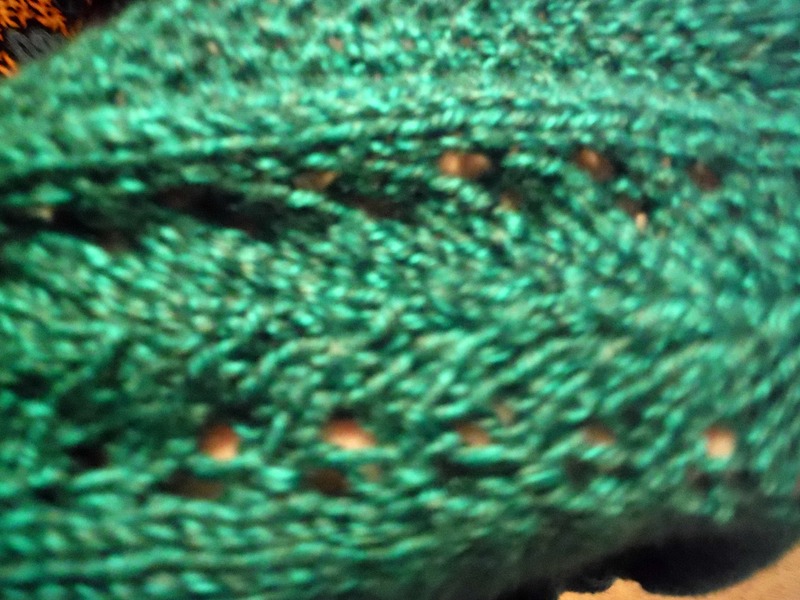 I used Lion Brand Heartland for the yarn, and it’s unashamedly one of my favorite fibers ever. The draw string is Paton’s Classic Wool Roving left over from my Cable Cape, rather than a ribbon. Even though I chose to use yarn out of necessity, I think I like it and I’ll probably leave it. I did actually block this, it’s the first thing I’ve ever bothered to block, and it really did open up the lace more than I thought it would. About the name: Alassë is Quenya (that’s Tolkien Elvish) for Joy or Merriment and Míriel is the mother of Feanor if you’re familiar with The Silmarillion, and in elvish means Jewel-Woman or Jewel-Daughter. Don’t let me ramble about Miriel or Tolkien, because I will. If I were to make this again, and to be honest I probably will, I would do more repeats in the body of the hood, to make for a taller hood, and start the decreases sooner, but spread them out more, to make them more subtle. That reminds me: I did alter the decreases. I found the five stitches at the back of the hood and marked them off. Then I decreased on either side of them, to make a wider area of decreases, and hopefully have less of a line down the back (like I saw in other projects). Overall it was a great pattern, and if its your kind of thing, its definitely worth buying!